I am new here in the forums and glad to see friendly people giving good advice. I live in the northern part of the Jersey Shore (I think its grass zone 8, if I looked it up correctly?) and just purchased our home a few years ago. The old owners seemed to like weeds and ground cover more than grass and I wanted to overhaul it since I got the place. 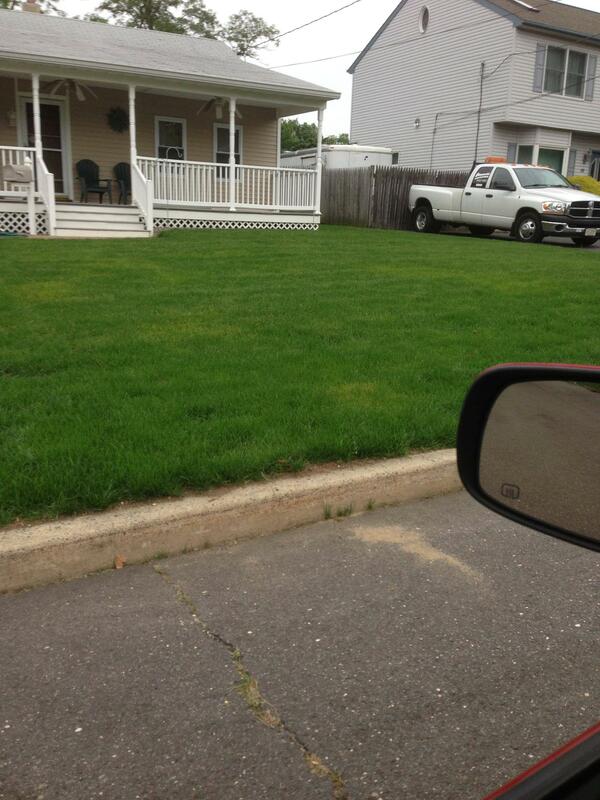 Its always been a dream of mine to have a great lawn in my front yard for my children to enjoy and play on. Here's my short story (sorry for the length). I have pics I am going to show below of the 'before', the 'high point', and the 'current'. Now keep in mind, this transformation all happened within the last 5 months or so. Notice in this one you can see I started with the scratch rake (yes my hands were killing me.. hehe). -he was going to give me seed and fertilizer. He said the brand he gave me is available in stores that only landscapers can buy from, Jonathan Green. I don't know if its true, but he said its good quality and I can only trust him from seeing how his lawn always looks year round. As you can imagine, I was very proud of the fruits of my labor... until the summer came and after getting a new job and gone 12+ hrs a day, I couldnt keep up with watering. That coupled with a week long heat wave about 3 weeks ago, my lovely green lawn went away. What I do know is that I am starting to get crab grass, which I absolutely hate and pull up from the ground as much as I humanly can. I also really don't like, what I was told is, the bermudagrass that I now have starting to thrive. It grows at a speed which is unreal!! Before my grass burned away from the heat wave the bermudagrass was growing way faster than the grass and I had patches that were very uneven each week. So... will my grass come back when it gets cooler, in the Fall? Should I do another wave of seeding and try my best to water like a madman? How do I safely get rid of that light green, what I think is, bermudagrass without killing everything else permanently? I'm not really a lawn person - I never even heard of grass zones before! Mainly by responding now, I'm bumping your post so some more people will see it. 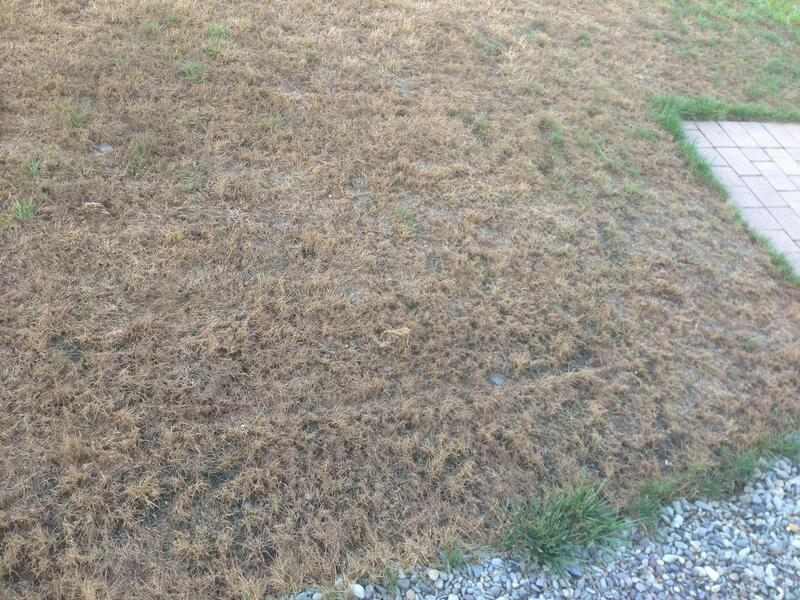 Most grass does go dormant in hot dry conditions, looking brown and dry. This is a protective mechanism. You can keep it from going dormant if you water enough, but at that point you are stressing it and making it more vulnerable to pests and diseases. 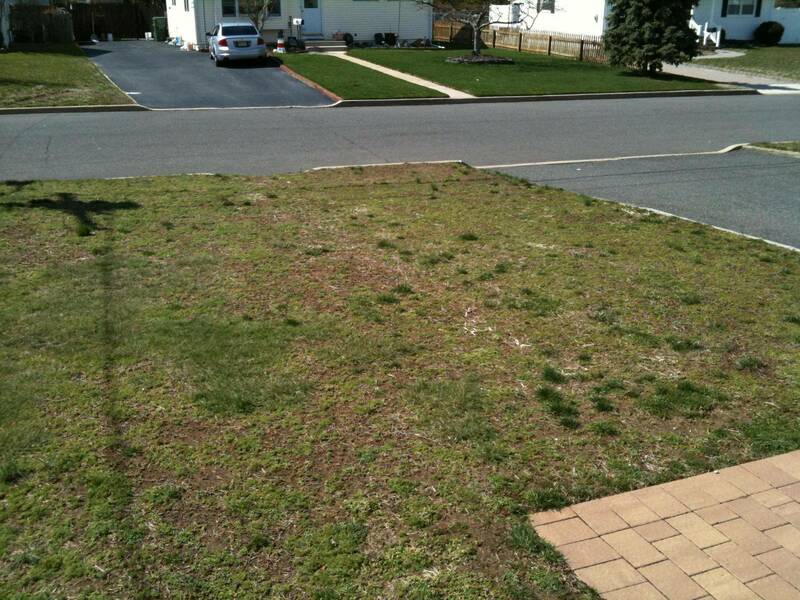 An established lawn will come back when cooler temps and rain return. But the established part is critical. Your lawn was new and certainly not real well established. So it remains to be seen whether or not it will come back. If you are not getting rain, I would water it deeply, once a week or so, to keep it alive and help encourage deeper roots. I think at this point, there's not much else you can do, except wait and see what happens and work on keeping the weeds from taking over. Don't fertilize while it is stressed and/or dormant. Don't think about planting any new seed until Sept-Oct. If it doesn't come back very well, you can overseed in the fall. What rainbowgardener said is a fact. the roots stay alive but go dormant. If you water it it should come back after a time. You have crabgrass and weeds as your soil had weed seeds in it, it may take time to get rid of them. grass needs an inch of rain a week. It also depends what your soil is like,if it is mostly clay or more sandy. The grass may be dormant or dead, it is hard to tell. The weeds will take advantage. 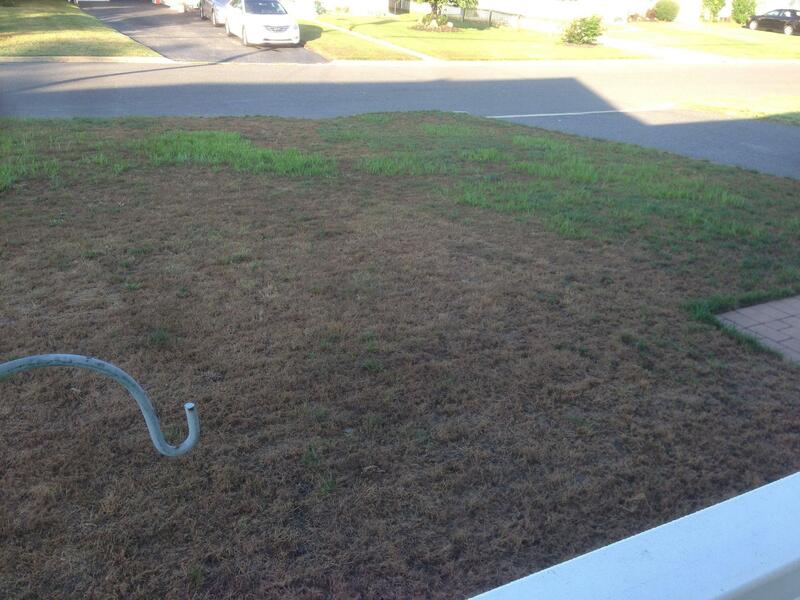 If you really want grass, and you don't have all that much time to water, consider putting in a sprinkler system. It is a good investment if you want a healthy lawn. In case the grass can make a comeback, keep ahead of the weeds. You can use a faucet timer hooked up to a sprinkler or set of sprinklers if you have enough water pressure to make sure the grass gets watered regularly. If your sprinkler cannot cover the lawn, you may have to move the sprinkler to another section and water deeply every few days in summer. It is best to set the timer for early in the morning. I set mine for 2 a.m. since less water is being used in the neighborhood so I have the highest pressure then. My grass is St. Augustine and emerald zoysia and neither of those grasses have problems with fungal disease and the grass is better off getting its drink in the morning than in the evening. I chose these grasses because of their drought tolerance and shade tolerance. I actually limit lawn as it is requires a lot more maintenance than a shrub border or a vegetable garden. But since you have kids, they do need a play area. If the kids are playing in the front yard. It might be a good idea to fence it someday to make sure the kids don't end up running into the street after a ball. Any weed barrier recommendations for aegopodium? any recommendations for landscaper or gardener in socal?